A deep knowledge of chemistry. A passion for innovation. An eye for seeing new opportunities. And a drive to create new solutions. Our founder, Godfrey Lowell Cabot, embodied all of these traits. A young entrepreneur with natural curiosity, Godfrey combined his knowledge of pigmentation and chemistry with an understanding of natural gas to become an early producer of carbon black. He knew that the emerging automotive industry could use carbon black in tires and plastic parts. He also knew the newspaper and magazine industries needed more carbon black for printing inks. This combination of factors led Godfrey to create a company that has been delivering new advances in the transportation, infrastructure, environment and consumer industries for more than 130 years. Here’s a brief look back at some of our major milestones. 1882 After graduating from Harvard University, Godfrey and his brother Samuel Cabot buy the McCue well near Worthington, Pennsylvania, USA and open their first carbon black plant. 1922 Godfrey forms his first legal entity when “Godfrey L. Cabot, Inc.” is incorporated. 1943 We open a carbon black facility in Ville Platte, Louisiana, USA, which is our first carbon black plant in the southern United States. 1948 We enter the European market for the first time as Cabot Carbon Limited and begin production at a new plant in Stanlow, United Kingdom. 1951 Cabot Carbon of Canada, Ltd. is formed and construction on a new carbon black plant begins in Sarnia, Ontario. We also begin construction on a new plant in Franklin, Louisiana, USA. Both of these plants still operate today, and they are an important part of our manufacturing footprint in North America. 1953 The Cabot Corporation Foundation, Inc. is established to support our community outreach activities. 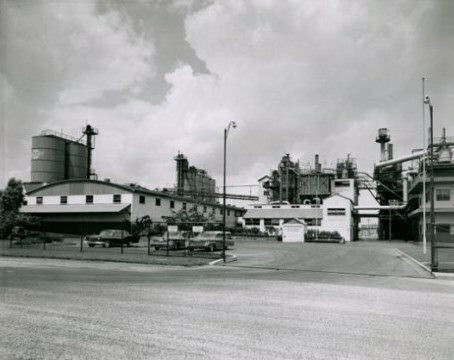 1958 We open our first fumed silica facility in Tuscola, Illinois, USA. 1959 Construction begins on a new carbon black facility in Ravenna, Italy. This plant still operates today and is an important part of our manufacturing footprint in Europe. 1960 We elect to merge Godfrey L. Cabot, Inc. and numerous subsidiaries into "Cabot Corporation," which remains our official name today. 1962 We enter the South American market for the first time as we open a carbon black facility in Campana, Argentina. 1968 For the first time ever, Cabot stock is made available to the public as 12% of shares are sold on the New York Stock Exchange. 1977 We open a carbon black facility in Maua, Brazil. 1981 Our global footprint expands in Indonesia and the Netherlands. We agree to build a new carbon black facility in Merak, Indonesia and we assume full ownership of a joint venture carbon black facility in Botlek, the Netherlands. 1986 Samuel W. Bodman is named president and chief executive officer. Our Awards for Excellence, the highest achievement within the organization, is named after him. We open our Asia Pacific Area Rubber Blacks division in Tokyo, Japan. 1988 We are one of the first United States-based companies to operate in China. We establish a joint venture with Shanghai Coking & Chemical Corporation to build a new carbon black facility in Shanghai. 1991 Our world headquarters move to Boston, Massachusetts, USA, and today we remain the oldest Boston-based manufacturer. 1993: We acquire 100% ownership of Tantalum Mining Corporation (TANCO) in Lac du Bonnet, Manitoba, Canada. 1996 We apply our expertise in carbon black surface modification to develop inkjet colorants and quickly become an industry leader with this new business. We also complete the construction of our fine cesium chemicals plant in Canada and establish our first cesium formate brine plant in Houston, Texas, USA. 1998: We establish bulk cesium formate brine handling facilities in Aberdeen, Scotland, United Kingdom. 2000 Our presence in Colombia expands as we acquire full ownership of a joint venture carbon black facility in Cartagena. We open a new fumed silica manufacturing facility in Midland, Michigan, USA and we expand our existing operations in Barry, Wales and Tuscola, Illinois, USA. We also establish a base in Bergen, Norway for our cesium formate brine operations. 2001 Kennett F. Burnes becomes president and chief executive officer. 2002 We solidify our leadership position in China as we expand our carbon black facility in Shanghai and begin construction of a fumed silica facility in Jiangxi Province. Our first commercial sale of Cabot Elastomer is recorded. This new class of material dramatically improves elastomer durability and delivers transformational performance improvements in wear resistance and vibration isolation applications. 2003 We open a new aerogel manufacturing facility in Frankfurt, Germany, allowing us to deliver solutions to customers around the world. 2004 We enter into a fumed metal oxide joint venture in Jiangxi, China with China National Bluestar (Group) Corporation. 2008 Patrick M. Prevost becomes president and chief executive officer. 2009 We issue our first Sustainability Report, detailing our safety, health and environmental performance over the past three years. We also join the American Chemistry Council, the Electronics Industry Citizenship Coalition and the Carbon Disclosure Project. 2010 Schaffhausen, Switzerland becomes home to our new regional headquarters for Europe, the Middle East and Africa. We open a new masterbatch facility in Dubai, United Arab Emirates. The advanced facility includes the latest environmental and manufacturing technologies, allowing us to better meet increased demands. 2011 ENOVA® aerogel and LUMIRA® aerogel products are launched, providing solutions for architectural daylighting, subsea pipelines, coatings, building insulation, personal care products and more. We add graphene technology to our portfolio through an intellectual property licensing agreement with XG Sciences, Inc. Our Tianjin, China facility is the first plant in the world to fully integrate masterbatch and carbon black production. 2012 Capacity expansion in Barry, Wales, United Kingdom strengthens our long-term partnership with Dow Corning and helps us meet the rising global demand for silicones. We expand our pigment dispersion production capacity for inkjet colorants in Haverhill, Massachusetts, USA. CAB-O-SIL® ULTRABOND 4740 fumed silica, a technical solution for the bonding paste market, sets new industry benchmarks for performance, ease of use and manufacturing efficiency. We become a world leader in activated carbon through our acquisition of Norit N.V., supporting the ongoing transformation of our portfolio to a higher margin, less cyclical, specialty chemicals-focused company. 2013 Our LITX™ 200 conductive additive is designed to solve the challenge of getting the most power from a lithium-ion battery without compromising energy density or increasing cost, and LITX™ G700 conductive additive is our first graphene-based additive to improve energy density of lithium-ion batteries. We introduce a new corporate brand and our carbon black footprint expands in North America through our acquisition of NHUMO, the leading carbon black producer in Mexico. ATLAS™ silica composite particles are designed to greatly improve the image quality and consistency of modern, energy-efficient toner in laser printers and multifunctional devices. 2014 We open a new carbon black manufacturing facility using state-of-the-art technology in Xingtai, China through a joint venture with Risun Group. Additionally, we open a new business service center in Riga, Latvia to help us serve our customers in the European, Middle East and African region. 2015 A new LP series of low polycyclic aromatic hydrocarbons (PAH) carbon black products is launched to help customers meet stringent performance specifications while ensuring compliance with regulatory requirements and quality certifications. 2016 Sean D. Keohane becomes president and chief executive officer. 2017 We acquire Tech Blend, a leading North American producer of black masterbatches, to extend our global footprint in black masterbatches and compounds.